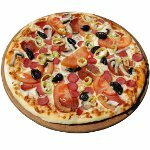 November 12 is the National Pizza with the Works Except Anchovies Day, also referred to as the National Pizza With Everything (Except Anchovies) Day. Pizza is an Italian dish that has become a popular fast food in many countries. It is an oven-baked flat bread with various toppings. Italian immigrants brought pizza to the United States in the late 19th century. The archetypal pizza, Pizza Margherita, is topped with tomato sauce, mozzarella, and basil. Pizza can also be topped with meats (including bacon, ground beef, ham, sausage, pepperoni), vegetables (such as bell pepper, fresh or sun-dried tomato, garlic, spinach), cheese, mushroom, seafood, pineapple, olives, and other ingredients. Anchovies can be used as a pizza topping, too. However, some think that salty fish can mask the flavors of other ingredients and spoil the pizza. November 12 is the perfect day to forgo anchovies on your pizza and revel in the taste of more subtle and delicate toppings. As there are myriads of various pizza toppings, you be able to choose the toppings which will perfectly suit your tastes and preferences. If you still want fish on your pizza, you can use other fish kinds, rather than anchovies, such as smoked salmon or tuna.